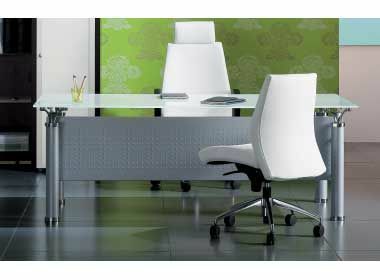 Designer glass office furniture from the Studio range with tempered glass tops in Clear, Frosted or Black glass. 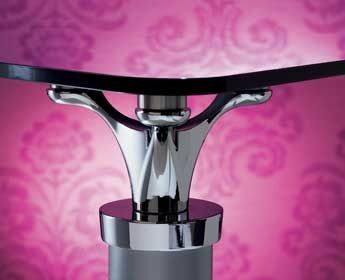 Designed and manufactured in Italy and delivered in 3-4 weeks from order. Studio wood finish and glass executive desks are available with a comprehensive range of storage cupboards, under desk pedestals desk returns and service units. 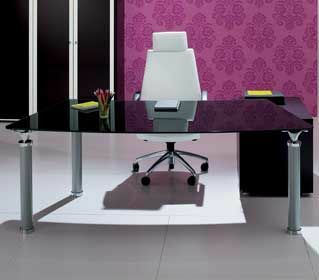 The striking aluminum silver legs on these glass desks are also available with an optional chrome cap and foot. Optional perforated metal modesty panels, and mobile designer bookcases are also available within this range. The glass desks available in Clear, Satinised, White or Black and this stunning office furniture is from our Italian manufacturing partners. Studio is available on a four week lead time and delivered to you free of charge straight from the factory if you have a UK mainland address. 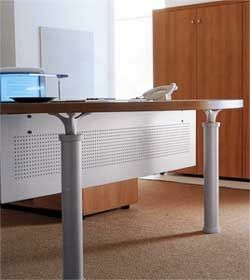 Please contact us for more information on Studio office furniture.